Hey Everyone! Thanks for taking a moment to spend with me. I want to share with you a Birthday Card that I made for part of a card order that I am working on putting together. I mentioned a couple posts ago that I am going to be sharing with you a bunch of various birthday cards with you, so here's another one! I thought that it would be fun to play along with a challenge over at Mojo Monday that I haven't had the chance to play along with for quite some time. It felt so good to join in the fun again and use a sketch to help me create the card. 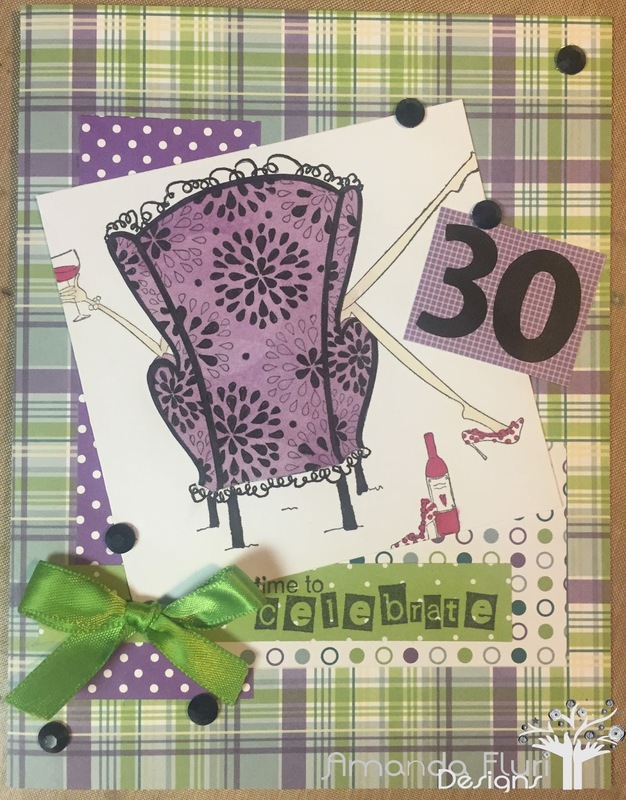 I started with colouring this image as I knew that it was something that I wanted on the birthday card and then selected papers to match. I paper pieced the chair, and coloured in parts of the design with a thin black pen to give it some dimension and interest. I tried to keep the colouring very simple as the papers that I chose were pretty wild. Such a fun card. Thanks for joining us for Mojo Monday. Thanks so much for such a great sketch. I am so glad to be back playing along again. Lovely mix of colors and a great custom birthday card! Thanks so much for joining us at Mojo Monday! Thanks so much for having me, I had a lot of fun playing along! I haven't used these colours in a while, but they look so great together!